In 2019 we are working on establishing year-round rooftop soccer leagues in Midtown or Downtown Atlanta, following the success of our three weekend rooftop soccer tournaments in Midtown (Fall 2016) and Downtown (Spring and Fall 2015) attracting a combined 143 teams, 1,200 players, and 3,000 spectators. Interested in partnering on our rooftop soccer initiative? Email info@sonsofpitchesfc.com for more details. We are looking for volunteers, advocates, civic and business decision makers, tournament sponsors, strategic partners, and investors. 10/28/16: "Soccer comes to MARTA Five Points station - and Midtown rooftops"
Sons of Pitches F.C. has literally set its sights a little higher — 8 floors higher, specifically. Atlanta’s largest intown soccer league is rolling out turf for its 3rd annual rooftop soccer tournament, this time heading to Midtown.The annual events are part of the organization's larger initiative to "transform highly-accessible but underused space into active space necessary for urban residents and workers to maintain healthy lifestyles." 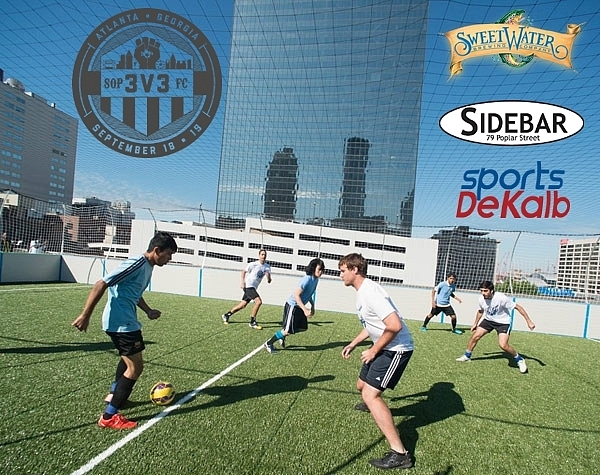 5/25/15: "Rooftop Soccer Takes Game to New Heights in Atlanta"
Soccer fans have found a new place to play their favorite games in Atlanta this weekend – rooftops. Players were on a downtown rooftop on Sunday playing the game ... on the top deck of a parking garage at 98 Cone Street. One of the co-founders said that with emerging development and fewer greenspaces, he hopes rooftop soccer will soon become permanent. "My big hope is to start running leagues on rooftops and it's hard; it's different," Christopher Wedge said. "The only ones I know of are in New York and in L.A. and I think Atlanta is a world-class city and deserves one. What we hope to do is do a tournament and eventually get a yes and do a league somewhere downtown." 6/25/15: 90-second YouTube highlights from our first rooftop tournament in Downtown Atlanta.